Throughout the years, Clark has evolved from being a former US military base to a bustling zone of robust economic activities and has positioned itself as one of the country’s premiere economic zones. The continuous surge in investments, thriving exports, and employment generation have catapulted Clark into a commercial and industrial activities success; now also as a tourism destination. The zone’s makeover is characterized by an unprecedented record in export volume. In 2011 alone, the Freeport zone was able to earn close to $4 billion in exports, attributed to the impressive performance of its locators and investors. This feat constituted 8.1 percent of the estimated total Philippine exports of P48.5 billion last year. With its sustained economic growth, a lot of investors are eyeing the Freeport Zone as their business destination. 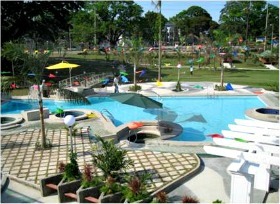 Over the years, Clark has also transformed itself into a prime tourism destination in Northern Philippines. A lot of world-class leisure and recreational facilities can be found inside the Freeport – golf courses, residential villas, specialty shops and restaurants, duty free shops, firing range, leisure parks, waterpark, hotels, casinos, and nature sight-seeing areas. The former military base is now also becoming a cosmopolitan metropolis that aside from offering interesting places to enjoy and unwind, also hosts with regular rhythm, a lot of events and activities catering to a wide spectrum of tourists and visitors. The annual Hot Air Balloon Festival every February has been a signature event at the former airbase. Accommodation is also never a problem inside the Freeport as there exists a number of hotels and lodging facilities that fit any kind of budget. Try checking in at the Holiday Inn, the Mimosa, Montevista or Fontana Villas, and you will surely get your money’s worth with their premium services and first-class facilities at prices easy on the pocket. The possibilities are limitless, especially as it houses what is touted as the country’s next premiere international gateway, the Clark International Airport, which now boasts of increasing budget flights and flight destinations to key cities in Asia and the Middle East. By land, getting to Angeles/Clark is also a seamless travel experience via the Subic-Clark-Tarlac Expressway (SCTEX) and North Luzon Expressway (NLEX).